Home Videos World BEE-lieve It Or Not - Man Stung By Bees 1200 Times And Lives! BEE-lieve It Or Not - Man Stung By Bees 1200 Times And Lives! This stinging survival story really is difficult to BEE-lieve! 65-year old American man, Lamar LaCaze, was stung more than 1200 times by a swarm of bees near his home in San Marcos (270km west of Houston Texas). By all accounts he has amazed doctors by actually surviving - they needed to pull more than 1200 stingers out of Mr LacCaze's (and also removed whole bees from his ears, nose, mouth and throat). Mr LaCaze was riding his tractor when it's believed that he disturbed the bees that were living in an old water heater. The bees then attacked. He said, "The bees ... just flashed up in my face. I couldn't stand up. They just keep [sic] buzzing me". 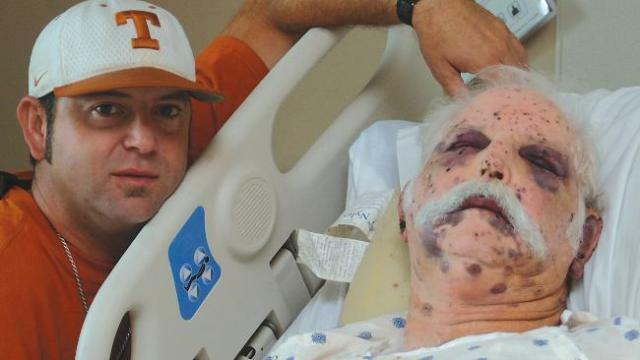 When his son, Trey arrived to the rescue, Mr LaCaze was father slumped over a fence not moving, with what looked like a black head - in fact, it was the wall of bees covering his entire head. I found it a little funny, that his wife's name is Lois (and they live in 'Lois Lane' - see the video below) - she was reported as saying that "Anyone who can survive that many bee stings is Superman."... Go figure! !